Brown University is a private university located in Providence, Rhode Island. Founded in 1764 as the College of Rhode Island, it is the third-oldest institution of higher education in New England and the seventh-oldest in the United States. It is a member of the Ivy League. Pembroke College, Brown University's all women's college, merged with The College, in 1971. Brown was the first college in the nation to accept students regardless of religious affiliations. 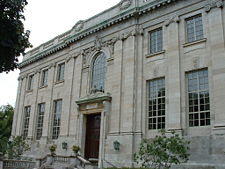 The school also has the oldest undergraduate engineering program in the Ivy League (1847) and once had the only History of Mathematics department in the world (housed in the same building as Egyptology). The Brown "New Curriculum," instituted in 1969, eliminates distribution requirements and mandatory A/B/C grades (allowing any course to be taken on a "satisfactory/no credit" basis). Moreover, there are no pluses (+) or minuses (-) in the grading system. Since 2001, Brown's current and 18th president has been Ruth J. Simmons, the first African American president and second female president of an Ivy League institution, as well as the first permanent female president of Brown. The school colors are seal brown, cardinal red, and white. Brown's mascot is the bearand the sports teams are called the Brown Bears. The costumed bear mascot named "Bruno" makes appearances at athletic games. The use of a bear as the University's mascot dates back to 1904. People associated with the University are known as Brunonians or, in informal tone or jocularity, Brownies. Admission to Brown is extremely competitive, with an overall admissions rate of 13.8% for the class of 2010. The class of 2011 has an admittance rate of 13.5%. The regular decision acceptance rate for the Class of 2010 was 12.6%, and the regular decision acceptance rate of the Class of 2011 was 12.3%.Brown does not accept the Common Application. More than one-third of the members of the Class of 2010 scored above 750 on the verbal or math sections of the SAT I: Reasoning Test Approximately 15 percent of the students in the Class of 2010 graduated number one or number two in their high school classes. Students come from all 50 states, as well as 65 countries. Brown's financial aid program awards approximately $70 million each year in the form of scholarships, jobs, and loans. Over 50% of students receive some form of financial aid. In the 2008 U.S. News & World Report college rankings, Brown ranked fourteenth in the nation among "National Universities" (tied with Johns Hopkins University and Northwestern University), and the lowest of the eight Ivy League universities. Over a decade ago, in 1995, US News & World Report ranked Brown second in excellence in undergraduate teaching. According to a study entitled "Revealed Preference Ranking," (date needed), Brown ranks seventh in the country when students are choosing which of the schools to which they are admitted to attend. Brown ranks fifth when the Revealed Preference Ranking method focuses on students interested in humanities and social studies and lower in the sciences and mathematics. A notable fact is that Brown ranks ahead of all the Ivy League schools other than Harvard, Yale, and Princeton. According to a 2007 Princeton Review survey of colleges, Brown is the fourth most selective college in America, and Brown's students are the happiest. 92 to 95% of Brown students are admitted to one of their top three law school choices, similar to all other Ivy League schools. As with the other Ivies, for business schools the figure is nearly 100%. Finally, Brown consistently ranks in the top 5 colleges in the country in terms of the percentage of students accepted into medical school. The College offers two different baccalaureate degrees: bachelor of arts (A.B.) and bachelor of science (Sc.B.) in various types of Major and Minor. 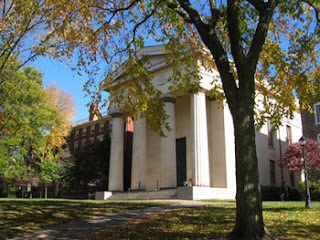 Founded in 1764, The College is the oldest school of Brown University. Nearly 6,000 undergraduate students are currently enrolled in the university, and approximately 80 concentrations are offered. The most popular concentrations are Biology, History, and International Relations. Brown is one of the few schools in the United States with a major in Egyptology available and the only school in the world with a History of Math major. Undergraduates can also design an independent concentration if the existing standard programs do not fit their interests. Established in 1887, The Graduate School currently houses over 1,500 students studying over 50 disciplines. Eight different master's degrees are offered as well as Ph.D. degrees in over 40 subjects ranging from Applied Mathematics to Public Policy. The University's medical program started in 1811, but the school was suspended by President Wayland in 1827 after the program's faculty declined to live on campus (a new requirement under Wayland). In 1975, the first M.D. degrees from the new Program in Medicine were awarded to a graduating class of 58 students. In 1991, the school was officially renamed the Brown University School of Medicine, then renamed once more to Brown Medical School in October 2000. In January 2007, self-made entrepreneur Warren Alpert donated $100 million to Brown Medical School on behalf of the Warren Alpert Foundation, tying Sidney Frank for the largest single monetary contribution ever made to the University. In recognition of the gift, the faculty of Brown University approved changing the name of the Brown Medical School to The Warren Alpert Medical School of Brown University. It is currently ranked 31st among U.S. medical schools in research and 23rd in primary care according to US News and World Report. Admissions to Alpert is one of the most competitive in the nation, with only less than 2% of those applying through the Standard Route accepted in 2008 (5,902 applications for 94 spots). The medical school is known for its eight-year Program in Liberal Medical Education (PLME), which was started in 1984 and is one of the most selective programs in the nation. Each year, approximately 60 high school students matriculate into the PLME out of an applicant pool of about 1,600. Since 1976, the Early Identification Program (EIP) has encouraged Rhode Island residents to pursue careers in medicine by recruiting sophomores from Providence College, Rhode Island College, the University of Rhode Island, and Tougaloo College. In 2004, the school once again began to accept applications from premedical students at other colleges and universities via AMCAS like most other medical schools. The medical school also offers combined degree programs leading to the M.D./Ph.D., M.D./M.P.H. and M.D./M.P.P. degrees.